Shakespeare gives these words to Falstaff, one of the biggest and best braggarts ever created. Falstaff is boasting as usual, making certain all gathered know of the greatness of his supposed deeds. A few of us have had the outrageous fortune to see another greatness, a recent television series which is, some critics claim, one of the best ever made. That’s quite a tribute, appropriately worthy of Falstaff. But I happen to agree with the critics (at least in this instance), as few shows have captured so perfectly their sense of place and purpose as Slings & Arrows. Never heard of it? I’m not surprised. 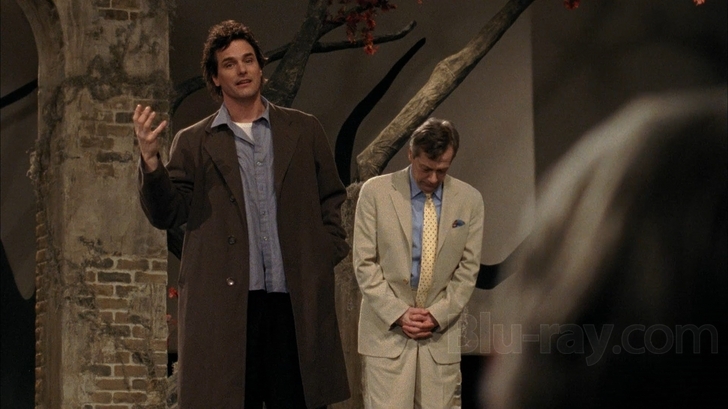 Slings & Arrows was a Canadian production, sweeping awards north of the border when it aired from 2003 through 2006. That might sound like it ran far too long to be found on this site… but in reality, only 18 total episodes of the series were made. And every single hour is, by turns, a hilarious and poignant love letter to the theatre. Slings & Arrows revolved around the world of the New Burbage Theatre, and the creative (and not-so-creative) personnel involved in putting on their stage shows. The New Burbage and its Shakespearean Festival have passed their heyday, reduced by marketers into offering the same traditional favorites to draw in the crowds (and the money) instead of producing shows worthy of taking chances and daring to be brilliant. Heavy lies the head that happens to wear this particular crown, artistic director Oliver Welles (Stephen Ouimette), who regrets his choices to “play it safe” and yet cannot bring himself to be the risk-taker he used to be. Distracted by these thoughts (and a fair share of drink), he ends up dying (at the end of the first episode, no real spoilers here), and New Burbage needs a new creative leader. Enter, stage left, a rather reluctant Geoffrey Tennant (Paul Gross). 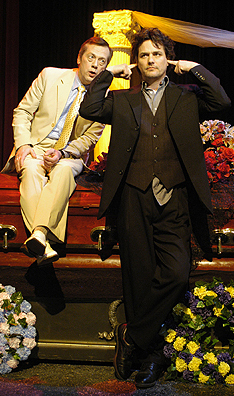 Oliver’s protégé, he was an up-and-coming star actor when, during his performance of Hamlet directed by Oliver, Geoffrey suffered a nervous breakdown onstage. He’s been scratching out a living ever since, until his name is put forth for Oliver’s previous position. With reluctance he takes the job, if only to keep it from falling to his old rival, flashy no-talent director Darren Nichols (Don McKellar). Geoffrey must now shepherd another production of Hamlet and face his own ghosts… but while he expected the ghost of Hamlet’s father in the play, no one told him another spectre would be Oliver himself. Geoffrey’s old mentor again appears, but only to Geoffrey, commenting throughout. But is it really Oliver, or just the elements of the nervous breakdown returning once more? In the midst of questioning his own sanity, Geoffrey tries to wrest control of the theatre back to the artists and away from the marketing people. The artists include New Burbage’s diva Ellen Fanshaw (Martha Burns), who was involved in that fateful performance of Hamlet seven years prior, and also “involved” with Geoffrey romantically; and young ingénue Kate McNab (Rachel McAdams) who dreams of becoming a star but is relegated to being an extra, starting at the bottom as Ellen did so many years ago. The marketing department is headed by manager Richard Smith-Jones (Mark McKinney), who falls prey to the wiles of corporate rep Holly Day (Jennifer Irwin). She wishes to take New Burbage and make it into a commercialized horror, complete with multiple trinket shops and a theme park atmosphere, ignoring the art in favor of profit. Anna Conroy (Susan Coyne), as Geoffrey’s assistant, tries to run interference between these two and the attempts at art onstage, but is most often left wondering if they’ll be anything still remaining once the dust settles. "Do you want to play Juliet? Or live it?" We also see others in and around the theatre, including Jack Crew (Luke Kirby), a Hollywood actor brought to the New Burbage by Smith-Jones and Day to push ticket sales. Crew has never done live theatre before, let alone Hamlet, putting the rest of the company on edge. A relationship with Kate blossoms, and despite his insecurities about both love and Shakespeare, he must find a way to give the performance of a lifetime… not only for his own sake, but for Kate, Geoffrey, and all who walk the boards at New Burbage. Ignore the fact that Slings & Arrows is a television series. It’s actually theatre, both at its best and its worst. Doubts about choices in life, belief in talent that isn’t really there, the push-and-pull of the heart for all the right (and wrong) reasons, and a love of living in the moment are all parts of what Slings & Arrows is about. Sounds great, doesn’t it? The best part? This is just the first six episodes!!! Slings & Arrows was designed like a great play, with a traditional three-act structure. The first season of episodes is all about discovery, growth, and (like the title character in Hamlet, the play being performed) finding out who you are meant to be. In the second season, Geoffrey and the New Burbage is maneuvered into presenting Macbeth, probably the most challenging of Shakespeare’s plays, and they must face new and different battles. Legend says that productions of Macbeth are cursed, and the denizens of New Burbage likely believe that to be true, thanks to their arrogant guest star Henry Breedlove (Geraint Wyn Davies). Financial woes force everyone to worry about their jobs, and how to secure their place in both theatre and life when the winds of change are blowing. Much like Act II of a traditional presentation, complications ensue for the heroes and their essence is threatened. Act III, the third season, brings forth a production of King Lear, and the casting of Charles Kingman (William Hutt), an aging tyrant of an actor to play the title character. Some question his ability at the late stage of his career, and others question his stamina (to the point of worrying about his living through the play!) The theatre itself must face its future too, and decisions must be made about the directions it will take going forward. It now becomes a fight for survival, both for an old actor wanting to relive his glory, and the New Burbage going forth as either a success or the scene of tragedy. If Slings & Arrows had been made for American television, it would never have worked, let alone been the phenomenal series it became. Simply the design of making the show would have caused its failure here in the US, because it would never have been allowed “endings”. Each season would have to be designed “open-ended” to lead to the next, instead of telling a story (and telling it fully). The idea of only six episodes per season allowed each hour to be a part of the whole, rather than just another installment along the way. The end of an episode wasn’t the end of a story, just an intermission until next week, and the end of a season was a place to contemplate what had happened so far and to decide where to take the characters next. Character change and growth was a continual part of the process, and Slings & Arrows was a play disguised as a television series. When writing plays (or movies, although “franchises” and sequels these days go against this idea), the story told is supposed to be the most important event in the character’s life. That’s why we spend two hours in a theater (or with the DVD) to become involved in their tale. But television is designed to come into our living rooms every week with a familiar cast of characters, telling stories about the people THEY interact with. The guests are the ones with the “most important event” happening, the regulars are just part of the events. Canadian and British television usually don’t do lengthy seasons, and sometimes only create six to ten episodes for a year. This defined and shortened length makes these presentations more like extended plays than American television series. In Slings & Arrows, the worlds of theatre and television come together, but in a way that can preserve the best of both, with each season being a self-contained story vital to certain characters, and yet allowing viewers their familiar friends along the way. Ratings were never a concern for this show. 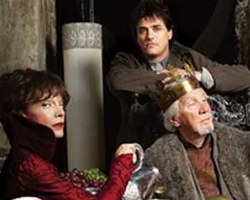 It had a set of stories to tell, framed over three short seasons, and it told them, with wit, drama, tears, and laughter. For once, I don’t have to describe what when wrong with a show to cause its demise… Slings & Arrows is practically perfect, just the way it is. STEPHEN OUIMETTE (Oliver Wells) was better known as a voice actor for many, having been heard on Beetlejuice (as the title character), and various voices on ALF-The Animated Tales, X-Men, Care Bears, and Babar. His role as Oliver on Slings & Arrows won him a Gemini Award, the Canadian equivalent of the Emmy. 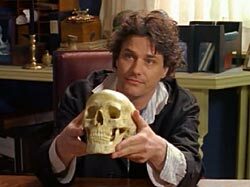 PAUL GROSS (Geoffrey Tennant) performed Hamlet at the Stratford Festival of Canada, supposedly one of the influences for Slings & Arrows. He’s best known to American audiences as Constable Benton Frasier, the Canadian Mountie in the series Due South. Most recently, he was a regular in the short-lived series Eastwick, playing the devilish Darryl Van Horne. 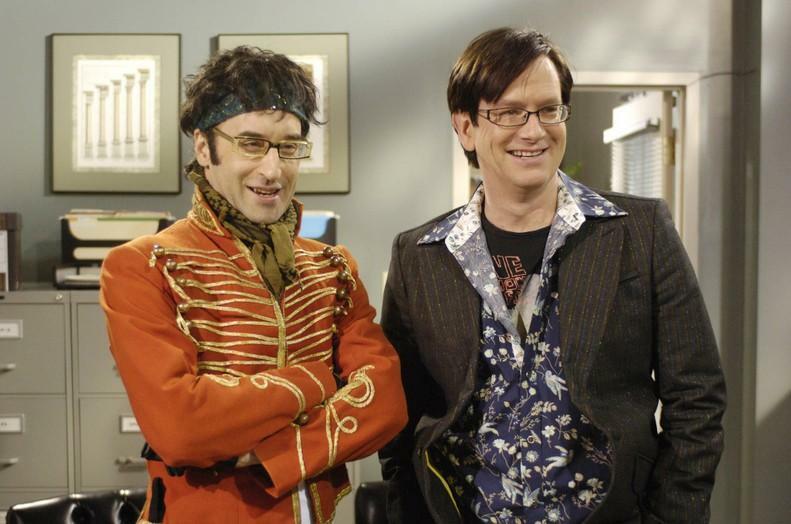 DON McKELLAR (Darren Nichols) is, like many of the cast of Slings & Arrows, a writer as well as an actor. He won a Tony award for co-writing The Drowsy Chaperone, along with Bob Martin (who, conveniently enough, is one of the co-writers of Slings & Arrows!) Prolific in his output, his name was once on six different films showing during the same Toronto Film Festival. MARTHA BURNS (Ellen Fanshaw) played the love scenes with Paul Gross very honestly, as they are husband & wife in real life. In the theatre world, Burns was a founding member of Toronto’s Soulpepper Theatre Company, and has appeared in numerous productions on the stage. She was nominated for a Gemini for all three seasons of Slings & Arrows, winning twice. MARK McKINNEY (Richard Smith-Jones) is a veteran of the sketch comedy group/series The Kids in the Hall, and is a co-writer of Slings & Arrows. He’s also been seen on Saturday Night Live and Studio 60 on the Sunset Strip (as a writer, naturally), and is one of the minds behind the new Canadian sitcom Michael, Tuesdays and Thursdays, featuring many of the creative staff from Slings & Arrows gathered again. SUSAN COYNE (Anna Conroy) is the final co-writer of the series, and her writing comes from extensive experience with many theatre groups in Canada, including the Stratford Festival and the Soulpepper Theatre Company. 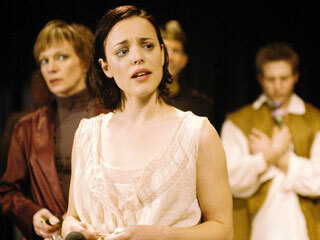 She was recently the playwright-in-residence at the Tarragon Theatre in Toronto. LUKE KIRBY (Jack Crew) is a graduate of the National Theatre School of Canada, and after a rather lengthy theatre career for one so young, he became a regular on the HBO series Tell Me You Love Me. Along with guest spots on Flashpoint, Law & Order, and Law & Order: Criminal Intent, he’s recently starred in the Canadian series Cra$h and Burn. GERAINT WYN DAVIES (Henry Breedlove) starred in the cult hit Forever Knight as police detective/vampire Nick Knight. He had regular roles on 24, To Serve and Protect, and on the final season of Airwolf. A musician as well, he’s recorded an album (“Bar Talk”) and performed in numerous stage musicals. WILLIAM HUTT (Charles Kingman) had a fifty-plus year career in live theatre, including noted performances in Shakespeare’s The Tempest. Ironically, his appearance in Slings & Arrows in 2006 occurred after his retirement from the stage. 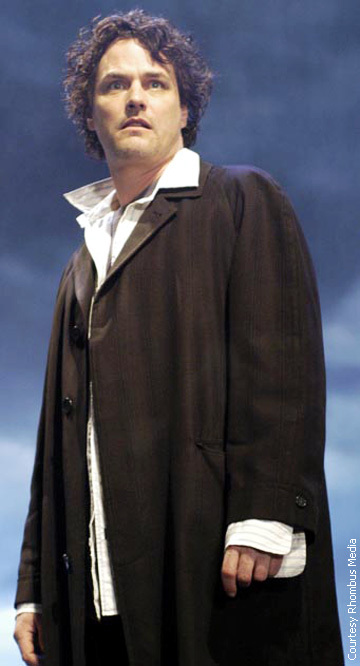 Although he was later slated to return to the Stratford festival in 2007, he ultimately had to cancel due to poor health. He died of leukemia shortly thereafter, in his sleep. For once, I get to write about a successful series on this site, and yet, like the subject matter of the series, it is one of those things that is best as a shared experience, like a live theatre performance. Whether Slings & Arrows is being dramatic, absurd, poignant, or sweetly heartfelt, it is, at all times, a moving experience for those who wish to be swept away by the possibilities of theatre in all its glory and despair. As a veteran of many on-stage productions myself, I can easily attest to the types of experiences portrayed here, both great and mundane. While most never observe the chaos “behind the curtain”, these people are real, no matter how outrageous they may seem to any who merely come to see a performance. Those who are merely viewers, for television or theatre, usually don’t realize the sheer amount of work that goes into creating those few moments on-screen or on-stage. Time, sweat, and frustration are all part of the process, and Slings & Arrows portrays that very well. But ultimately, as the characters show, there comes a moment when the presentation transcends this ordinary mortal coil, and for that one brief experience, there is nothing but the reality of the performance, sharing the emotion with those watching in a way that is impossible anywhere else. That’s why those of us who put in that time, who sweat those details, who go through that frustration, all make the extreme effort. That’s why we do it… that’s the meaning of “To be”…. I will always suffer Slings & Arrows, nobly, and most gladly. Aired at Friday 8/7 Central? For once, I can’t honestly find an original time slot for this show. As The Movie Channel and Sundance both repeated shows quite often, I just don’t have an answer for this. Any help or info is welcome.